the austin clinic, a migraine and harry hole | is there any more pie? Posted on December 15, 2013	by is there any more pie? Harry Hole is a fictional character. Have you heard of him??? If you have, you know that in his most recent book (the one published in October, 2013) he was in serious, bloody, deathly, deadly trouble. Last October I had a migraine and ended up going to a walk in clinic for medication, where I met with a doctor. I was reading my Kindle while waiting to talk to her, and we immediately began discussing books. When she heard there was a new Harry Hole novel, she almost fell off her swivel stool. Really. She gasped, too. (There was a good reason for that, but because it’s book 10 I’m not going to tell you what it is). I explained to her that I hadn’t read it yet, that I had splurged and bought it on my Kindle as a reward for when my own writing was finished, that I would be reading it in November. That I hadn’t read any reviews and didn’t want to know what was going to happen. I didn’t want any hints or spoilers. She was thrilled. We exchanged names of favorite authors and scribbled book titles on scratch paper and promised to read each other’s recommendations. So, you probably want to know who Harry Hole is. Harry is a detective on the Oslo police department in Norway. He’s a genius, a lone wolf, a man with “issues”. The books, by the brilliant Jo Nesbo, were not released in order in English, so reading them in chronological order can be a bit of a challenge. For more information, check out Crime Fiction Lover’s Guide to Harry Hole. I really enjoy these gritty, brilliant crime novels set in dark, cold countries. No snakes, no bugs, no malaria…could that be the reason? p.s. I am on page 44. I am reading very, very slowly. I don’t want it to end. 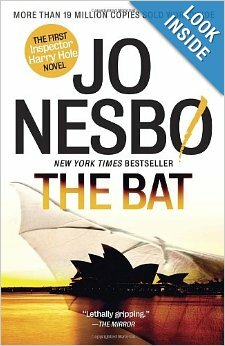 And I hope Jo Nesbo writes quickly and spends many hours at his desk writing the next novels. This entry was posted in books & music. Bookmark the permalink. Jo is a man? I thought it was a woman. Ha, those crazy Norwegians! I’m going to look for them…in order. It’s hard to get them in order, Sharon, though I think the publisher has finally released the translations. The last three should be read last, though. That’s important! And Jo is also a musician–how does he find the time to write books and be in a band???? ?